Here are four thoughts about Friday’s women’s regional semifinal games, which featured four upsets. Syracuse made its premier Sweet 16 trip a memorable one. The No. 4 Orange stunned top-seeded South Carolina, outlasting the Gamecocks 80–72 in Sioux Falls, S.D., on Friday night. South Carolina (33–2) opened the game with a series of missed shots, turnovers and fouls, two of which landed senior guard Tiffany Mitchell on the sideline. In Mitchell’s absence, senior guard Tina Roy attempted to save the Gamecocks from elimination, knocking down five three-pointers and scoring 17 total points off the bench in the first half. Syracuse kept the game close early with a tough defensive effort. The second half however, was all Orange. Alexis Peterson dropped 26 points, including a (banked-in) 3-pointer that tied the game with just over six minutes remaining. Brianna Butler, who had only made six of her last 35 shots, rallied and scored 16 of her 18 total points in the second half. Center Briana Day grabbed 13 rebounds and guard Brittney Sykes also added 17 points. Syracuse held off dynamic double doubles from sophomore A’ja Wilson (15 points, 10 rebounds) and senior Alaina Coates (18 points, 16 rebounds), advancing to the program’s first Elite Eight appearance. Just four days after stunning Maryland on the Terrapins’ home court, the No. 7 Washington Huskies defeated third-seeded Kentucky Wildcats at Rupp Arena in Lexington, Ky. Kelsey Plum, Chantel Osahor and Talia Walton, also known as Washington’s “Big Three,” combined for 72 points in a dominating 85–72 win over the Wildcats. Forward Osahor poured in 19 points and ripped 17 boards, while guard Plum maintained her steady scoring presence, shooting nearly 50% from the field and adding 23 points. Forward Talia Walton was the big scorer of the night, dropping 30 points on Kentucky. Washington shot 59.4% in the second half to close out the victory. Huskies’ head coach Mike Neighbors praised his trio at the end of the night, saying “This is the first time all three of them have played that well on the same night. That’s what your supposed to do when you get to this point.” The Huskies advance to the regional final on Sunday to take on Pac-12 foe Stanford, hoping to make the program’s first Final Four appearance in school history. • DEITSCH: Women’s Sweet 16 picks: Which teams will win on Saturday? ​Ohio State guard Kelsey Mitchell was averaging nearly a point per minute in the first two rounds of the NCAA tournament. She posted yet another 20-point game in the regional semifinal against the Tennessee Lady Vols, but this time it wasn’t enough. 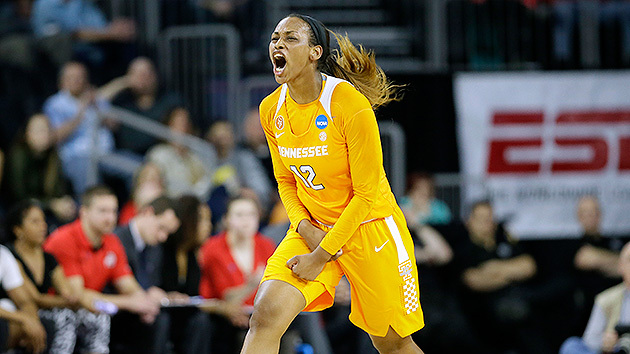 Tennessee cruised past Ohio State 78–62, maintaining a convincing lead for most of the night. The Buckeyes managed to hold Diamond DeShields to 10 points (3 of 4 from the field), but center Mercedes Russell commanded the Lady Vols’ offensive efforts, dropping in 25 points inside. Three players—forward Bashaara Graves (14 points), Te’a Cooper (16 points) and Jaime Nared (9 points) helped Tennessee come within one point of having four players score in double digits, proving that it might have one of the deepest teams remaining in the tournament. During the regular season the Buckeyes shot almost 40% as a team from the beyond the three-point line and had the third-best scoring offense in the country, but Ohio State was stifled by the Lady Vols’ defense, knocking down just eight of 30 three-pointers in the Sweet 16 game. The Lady Vols will appear in the program’s 28th Elite Eight on Sunday, looking to advance to the Final Four for the first time since doing so under Pat Summitt in 2008. Two Stanford juniors led the fourth-seeded Cardinal past top-seeded Notre Dame in the third round of NCAA play in Lexington, Ky., eliminating the Irish’s chances at a sixth consecutive Final Four appearance. Junior Erica McCall netted a career-high 27 points, Karlie Samuelson dropped 20 points and the Cardinal upset the Fighting Irish 90–84 in Friday’s regional semifinal. Notre Dame chipped away at a 15-point deficit and made a final push with just over two minutes remaining. Following Madison Cable’s score, Samuelson banked in a three-pointer as the shot clock expired—with 1:31 remaining in the game—helping to seal a Stanford win. Brianna Turner, the ACC Player of the Year, scored 16 second half-points after a scoreless first half and Lindsay Allen recorded 20 points for Notre Dame. Stanford also benefited from a balanced scoring effort from freshman guard Marta Sniezek and junior guard Lili Thompson, who each scored 11 points.